The bears have returned. In May the SPX lost 100 points closing at 1089. In spite of the recent drop of almost 15 % I can't say yet that the bear market has resumed. 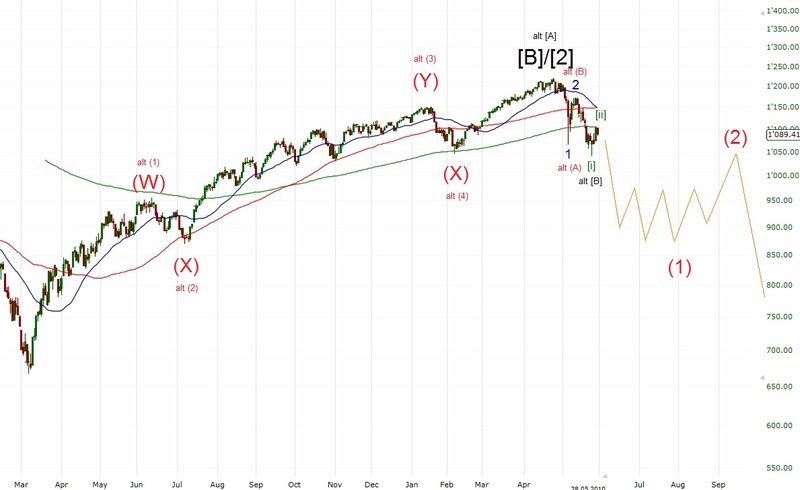 The next days/weeks should show whether we're indeed on the way to SPX 500 and lower. The question is whether wave [ii] is completed (double Zigzag) or if there is one more Zigzag to come early next week to 1110-20 (triple Zigzag). 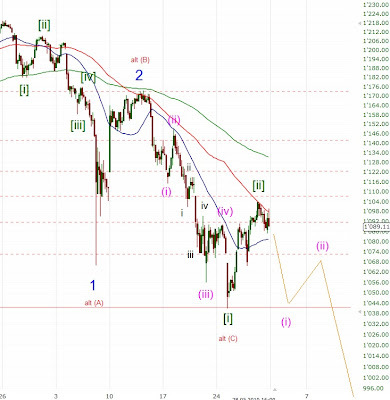 If the SPX exceeds 1100 it's most likely a triple Zigzag, while on a drop below 1085 the double Zigzag count should be the right one with confirmation below 1066. I prefer the double Zigzag because I don't think that the market should exceed the hourly MA 76 (currently at 1103). I think that the SPX finished wave [ii] or will finish it within the next few days. Wave [iii] should take the index down to 900ish within a few weeks. Important levels are 1066 and 1040 - a drop below the latter confirms wave [iii]. So, the market should rally from here. 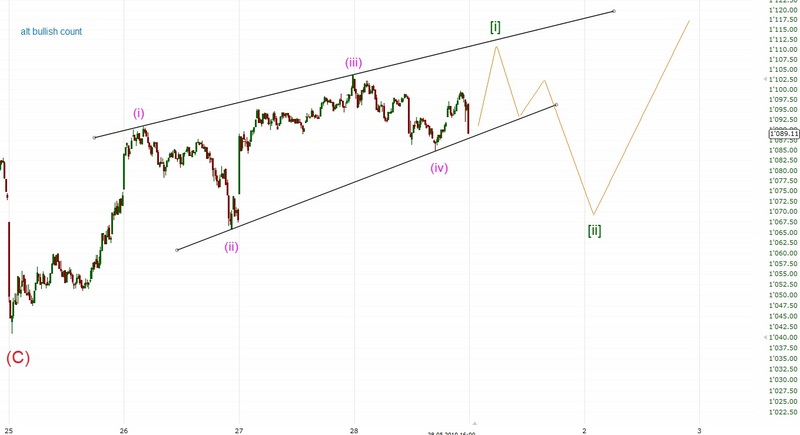 First condition for this count is a rally next week to 1110-20 without declining below 1066. This rally should be followed by a correction to 1070-90 and then a rally above 1174. 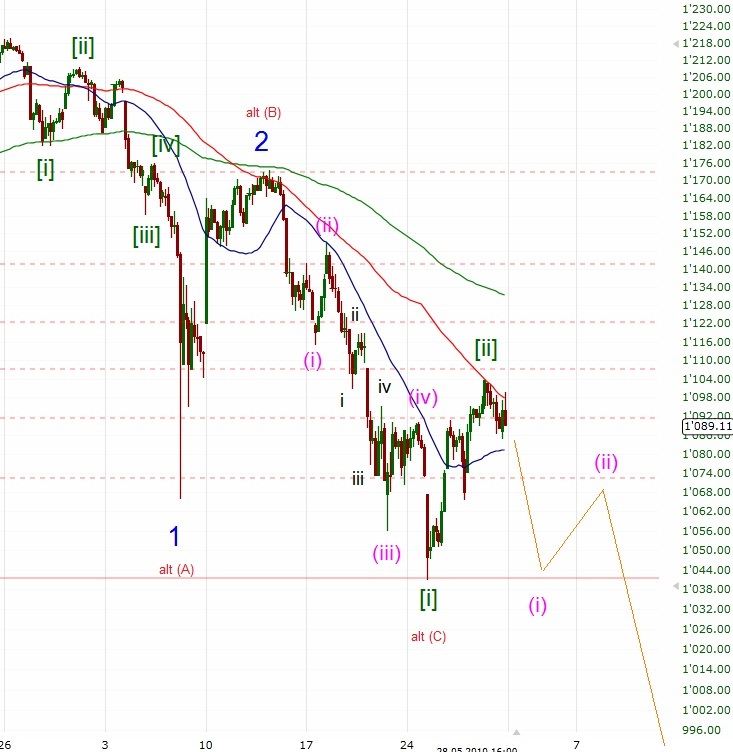 Confirmation for this count we don't get until 1220 is exceeded (>1174 should be almost a confirmation though). Long term both counts, the medium term bearish and bullish, will lead to a big crash. The next days and weeks should help to determine whether a Primary [B] or  finished at 1220 and Primary [C] or  to SPX below 500 is underway OR whether Primary [C] to 1600 will complete cycle wave d of an Expanding Triangle started in 2000 (see here to get the idea). 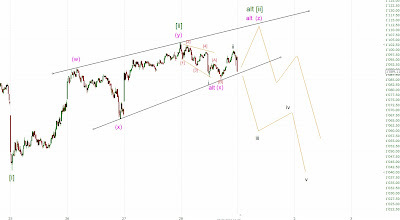 Cycle wave e should follow then with the same target of SPX 500ish and lower.